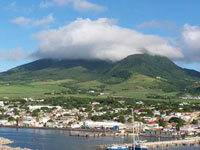 The little island of Saint Kitts offers an unexpected wealth of sightseeing activities for visitors. Most will be perfectly content without moving beyond the gorgeous beaches. Top attractions within Basseterre include the Circus, Independence Square, and the Treasury Building, housing the National Museum. The UNESCO-listed Brimstone Hill Fortress sits above the city and is well-worth the climb. Those capable of tackling a fairly strenuous climb are rewarded for hiking up Mount Liamuiga, the island's dormant volcano. There are also some good walking trails through the rainforest, protected in the national park that covers roughly a quarter of the island. Those who prefer not to break a sweat can take the scenic drive to the views from Bloody Point, the site of the colonial massacre of 2,000 Carib Indians. Another way to tour Saint Kitts is to board the popular Scenic Railway which makes a three-hour circuit around the picturesque island. Other attractions include Romney Manor, a 17th-century sugar estate, and the Fairview Great House and Gardens, a colonial mansion dating back to 1701. We are looking for contributors for our St Kitts travel guide. If you are a local, a regular traveller to St Kitts or a travel professional with time to contribute and answer occasional forum questions, please contact us.